Work stories usually take place at work, but Tanya Karnick’s story took place at home while she was working. Her story was about her youngest daughter when she had a large group of friends over at their house. When she came home to check on them, she saw them staggering on the sidewalk. Drunk. It was okay though, it wasn’t the cat, dog or older sister’s fault. Sorrina Beecher was also a first time storyteller. Her story takes place over the span of her son’s lifetime, from when she was working double shifts while pregant. While she was in school at that time she was told, “you’re a single mom, you’ll never be a journalist.” Then she became a crime reporter in Lumbertown, North Carolina and graduated from Marquette University with honors. 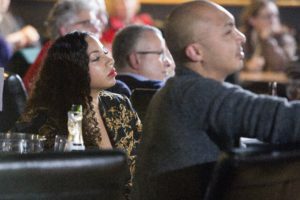 Today, she spends her days at Mueller Communications and continues to work as a freelance journalist through her personal business Write MKE Ink. Weston Maier started his story by saying he’s sorry. His story is about school, or about the unpaid work that is the last two years of medical school. It was during his last two years of unpaid work that he realized there is something magical about working with kids. He was going into pediatrics. Best UltraShort of the night? “Been there. Done that. Retired.” – Anonymous. Great impressions and energy brought Richard Kerhin’s story to life. For years he would quit and reapply for the same job only to get it evrytime. It wasn’t until he woke up to two big Italian men at the edge of his bed ordering him to make pizzas that he decided to make a change. And then ended up working for another restaurant with ties to the Italian mafia. Another first timer, Michael Frohna took the stage at the urban country club. We all have first jobs filled with lots of questions and not enough answers. His first job included a story about two brothers from two sides of the track. His friend was let go from the job, but who he still considers a brother. More first timers took the stage as Karen Nelson shared her story with everyone. It was 1994, she was a working in the ER as a nurse when she was asked to help a patient near to death. She didn’t expect her gum to become part of the operation, but it did. Ex Fabula’s own Kennita Hickman took to the stage for the first time. She told the story of how she ended up at Ex Fabula after leaving her last fellowship. Only to end up on stage with a crown and doing a great job! Elisabeth Bentti was another first timer of the night. She shared the story of how she became the produce manager at work. After being told that produce needed a woman’s touch, she started working with Pete. Then the cops questioned Pete at work. What do you do when the cops are already at work? Call the owner. That’s how she became manager. A previous storyteller, Ben Merens, shared the last story of the night. A story within a story, he shared his journey of becoming a professional storyteller. 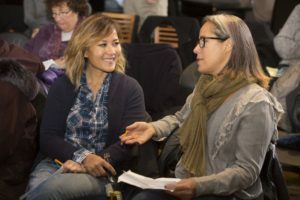 Thank you to Social X MKE, Hispanic Professionals of Greater Milwaukee, and Hmong Young Professionals who partnered with us on a “Work” themed storytelling workshop, and our event partner Wisconsin Humanities Council and The Working Lives Project. Our next curated StorySlam is Risking It at the South Milwaukee Performing Arts Center on Friday, November 17. See you there!